This topic contains 4 replies, has 3 voices, and was last updated by Allenwood 2 weeks, 2 days ago. Ok, so i uploaded the StandardFimata(sp) sketch(and tried the one that says “for uno”) the pin 13 LED on my UNO is consistently blinking, I downloaded the source files “zip” and unzipped it. I’ve attached a screenshot of what files i see. I don’t see any executable or anything like that(i’m on windows 7 64Bit) I do have java installed, i went to the java website and it detected that i have it installed. So i just odn’t know, how do i get the GUI? 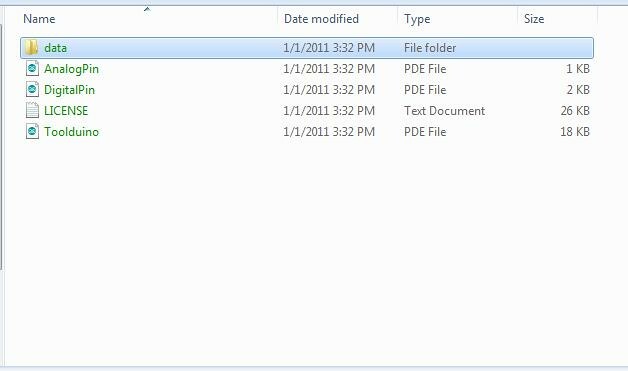 the only important files i see in that zip folder are 3 .pde’s (ardunio sketches) do i upload those to the board? or what? Sorry if this is too noob, but i didn’t see this answer anywhere on the forums or on the page for tooldunio. EDIT: it appears your links to “windows” “Mac” Linux” don’t work, i looked at the source code for the page and found the link : http://nootropicdesign.com/toolduino/downloads/windows/Toolduino-1.1.zip I’m using Firefox and they just show up as plain text to me and aren’t click able, had to right click and view page source to find the link. Ouch, thanks for pointing out the bad links. I fixed them. That’s the second time I’ve experienced a link problem on my site — something is clobbering them (probably when I use an online editor or something). The .pde files in the Toolduino source are actually Processing source code, not Arduino source. Arduino is modeled after the Processing project, and they chose the same source code suffix (I don’t think that was a good idea…). Toolduino is a Processing application. .pde files are Processing sketches. This Toolduino is very very old, so I’m not sure it works any more….